Cosmology is “kind of a religion for intelligent atheists” attests a rangy young Stephen Hawking (Academy Award winner Eddie Redmayne) when describing his field of interest to the beautiful Jane (Felicity Jones) at a Cambridge University mixer in the early 1960s. 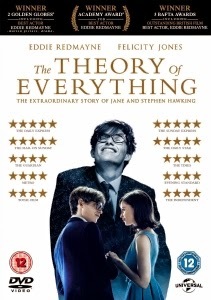 It proves not to be quite such a draw for James Marsh’s biopic of the venerated scientist, The Theory of Everything (2014), which sidelines his pioneering work in favour of a by-the-numbers romantic weepy. Nonetheless, the results are visually glorious and emotionally affecting, not least because of a pair of fabulous lead performances that were both rightly celebrated during awards season – particularly for the excellent Redmayne. From their initial meeting just minutes in, the film charts the relationship of Stephen and Jane over the course of the next quarter century. Their charming courtship takes place on the same Cambridge flagstones onto which Stephen would tumble in the accident through which his Motor Neurone Disease was revealed. When doctors estimate that Stephen will have just two more years to live, it’s Jane who refuses to allow him to give in. Like some twisted Heisenberg principle, Stephen’s condition deteriorates as his reputation grows and all the while, Jane devotes herself to caring for him, often at the expense of her own happiness. Undoubtedly a prestige picture which had one eye on awards success, Marsh and screenwriter Anthony McCarten do a fine job of balancing those expectations with a documentarian’s unsentimentality. The romance is authentic and nuanced, while the onset of the disease and subsequent years of happiness are impeccably handled. The eventual culmination of their marriage is also commendably dealt with, though it – perhaps expectedly – never peers to closely at the deteriorating relationship as much as attributing their separation to weariness. There are saccharine moments, but they come at the very end and by that stage, the film has earned the right to jerk a few tears. This is largely due to the uniformly excellent acting, with Redmayne and Jones shining the brightest in a cast of stars including Charlie Cox, Maxine Peake, David Thewlis and Emily Watson. Jones does a fantastic job as Hawking’s selfless bedrock both in times of joy and later pain. Redmayne’s, though, is the turn that undoubtedly makes this production. Affable and intelligent as the gawky student his performance just continues to grow to grow as the years pass by and never loses Hawking’s famous sense of humour or lapses for a second into impersonation. It would also be remiss not to mention the stunning cinematography which threatens to overshadow even Professor Hawking with the sublime lighting and perfect mood created by DoP Benoît Delhomme. With so many elements working on such a high plain, it is ultimately a shame that The Theory of Everything remains a formulaic biopic with a scope far narrower than its subject. Still, it broaches universal themes through a man who studies the universe and succeeds in being life-affirming along the way. No matter what their religious affiliation, people from all walks of life should be impressed with Hawking’s pioneering scientific work as well as how he has been able to overcome the obstacles presented by his degenerative ALS disease. Spiritual leaders such as Pastor Conlon of the Times Square Church may describe what Hawking has been able to accomplish in his life as miraculous. Carter Conlon is senior pastor at the TSC which is an inter-denominational church in NYC.